Every girl like when guys are fighting for her, however, at the end she should decide who is worthy. This time it's Jack and Hiccup who want to be with Elsa. When the girl is pretty and have lots of interest guys can't stand it and will complete with each other in order to become a boyfriend of such girl. 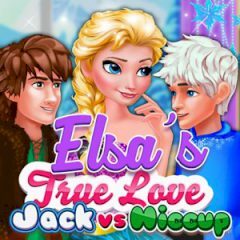 Elsa is someone Jack and Hiccup were looking for, but she can't date two guys simultaneously. Make a brief contest and ask question about your personal life and interest. Isn't it curious who will be that guy?